They may be too busy co-building (with the Dutch) their own POLA frigates based on the Dutch Damen 'Sigma' Frigate. Well, I thought it should be very obvious by now that there is no way Seaspan can build all of the non-combatants for the coast guard and navy in a timely manner. But, apparently, there are many bureaucrats that disagree with me. Industry sources close to the deal said there have been a number meetings with federal officials, but no clear progress so far. There are serious capability gaps within the federal fleets that need to be addressed, said both Sloan and Perry. ok, so whats the narrative now? - government signs contract for said ships and jobs and says "we inherited a turd"
- government arranges to have senior military appointee charged for said "turd"
- criminal trial is a month away for senior military appointee. - facts will be disclosed at trial, uncomfortable facts. - if option 1 and 2 are out, is there another turd option? "If one cannot lease the turd or one cannot design and build the turd, then one must BECOME the turd"
And what will effect of CSCs' massive (and still really unkown) cost be on CAF budget capabilities overall, given that we are never going to get close to spending 2% of GDP on defence? The Australian government has been warned that its naval shipbuilding programme (NSP) could consume so much of the country’s defence procurement budget that it might put at risk the ability of the Australian Defence Force (ADF) to respond to emerging priorities. The Australian Strategic Policy Institute (ASPI) said in a paper about the country’s defence budget on 24 May that the NSP – featuring the planned procurement of assets including 12 new submarines, nine frigates, and 12 offshore patrol vessels – could eat up about one-third of the country’s procurement expenditure in perpetuity. ASPI said that even taking into account future growth in the budget and the government’s plan to raise the expenditure to 2% of GDP by 2020–21 [emphasis added], the procurement expenditure could be stretched and the government will be challenged to sustain a balanced force structure. I hope that ramp can actually reach the ground! When does it hit the water? Sometime later this Summer? They look similar to what the CCG used in the Arctic? You mean those horrible steel ones? I remember working at the Port of Belledune and having to regularly give the metal on the coal crane a little TLC for rust and corrosion. I'm hearing late fall (Dec) from some places (skuttlebutt). But that might be the date she's turned over to the navy. There are still builders/acceptance trials in the timeline somewhere. Subcontractor delivery issue and the fact the bow was 60mm too wide has caused some delays. On the plus side the same skuttlebutt says that AOPS #2 is relatively on schedule. My son is on that build. He says September. He’s got to be proud working on that big bugger! I hope he has a long , fulfilling and enjoyabel career! Me too, as l hope to join him in a couple of months. 3 hours prior to 20:17 MST. But article not available at 20:17 MST. 404. CBC doesn't like me anymore, because both of these link tell me the story I seek doesn't exist. I guess that's what I get for regularly writing to tell them to check their facts. Well I’ll be.....the article was there previously. I guess they pulled the story for some reason, maybe someone got cold feet. I have the article open in a cached version, haven't read it yet. If you open it that way it will work if you stop the browser from refreshing. Edit: This gist of it was Davie praise but mainly that the 3 Viking icebreakers were selected, the AIVIQ was not, work will begin this summer. I was hoping Canada would pick up the AIVIQ too. Chantier Davie Canada Inc., the country's largest shipbuilding firm, is gunning for contracts to build new icebreakers for the Canadian Coast Guard. "Given the age of the Canadian Coast Guard fleet, the entire icebreaker fleet will need to be replaced in the near future," says Alex Vicefield, CEO of Inocea Group, which has owned Davie since 2012. "We have every intention of submitting a world-class proposal together with global leaders in icebreaker design." Until then, Davie, located across the river from Quebec City in Lévis, is in the home stretch of negotiations with the federal government to convert three surplus commercial icebreakers for the Canadian Coast Guard. Under its new management, Davie has made its mark in the industry by turning surplus ships into lower-cost solutions. The first converted icebreaker will be ready in time for the 2018-2019 ice season on the St. Lawrence and Great Lakes. However, when it comes to building new ships, there remain doubts about Davie's ability to deliver at a competitive cost. Marc Gagnon is director, government affairs and regulatory compliance for the Montreal-based Fednav, which operates a fleet of nearly 100 ships. Fednav buys its ships in Japan because, Gagnon says, Canadian-built ships cost "at least twice as much." "Davie no longer has the capacity to build an icebreaker or a frigate," Gagnon said. "To do so, they would have to re-equip their shipyard." Vicefield said Davie is aware of the challenges ahead and has invested $60 million to upgrade its steel-cutting and IT infrastructure. The University of British Columbia's Michael Byers, who argues that Ottawa's current shipbuilding strategy is too costly and needlessly slow, says building government ships in Canada makes sense and Davie is definitely up to the task. "For every $100 million that is spent on building a ship in Canada, you would get several times more than that in terms of knock-on economic activity," Byers said. "And Davie is the logical place to do it. They have a very large shipyard. They have a very capable workforce. The labour costs are relatively low and it's an active shipyard." 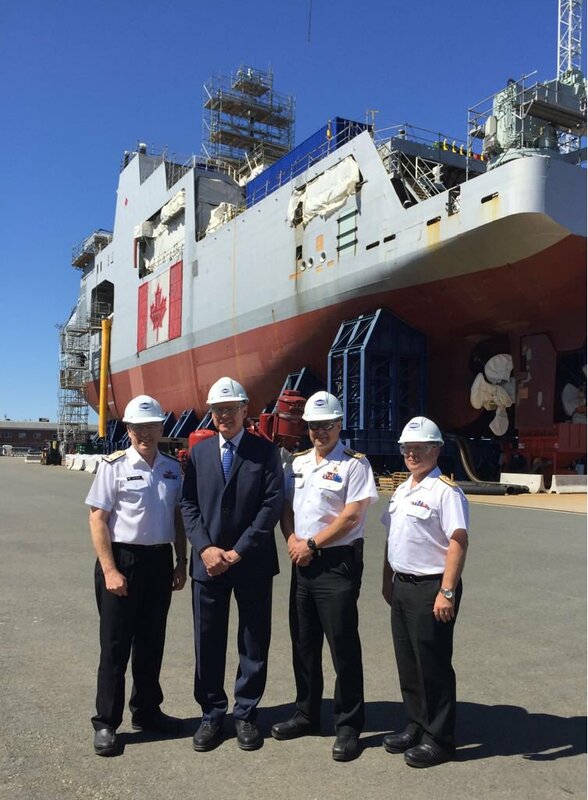 Last year, before Ottawa agreed to sit down with Davie to discuss the icebreaker conversions, Davie delivered the Asterix — a container ship converted into a supply ship for the Royal Canadian Navy — on time and on budget. ​In 2015, when the navy's existing two supply ships were no longer seaworthy, Vicefield and his team proposed converting the Asterix to a naval supply ship for about $600 million. "What they did with the Asterix was very impressive," Byers said. "There is no other shipyard in Canada that could have done that." In comparison, Vancouver-based ​Seaspan was chosen to build two new navy supply ships for $2.6 billion. But the first new supply ship will only be ready in 2020. "This is a cutthroat business and there is a lot of money involved and a lot of politics involved," Byers said. "Davie has the capacity and the experience to build icebreakers, plus they have the lowest costs in terms of labour of any shipyard in the country," he said. The Canadian Coast Guard has an aging fleet of 13 ice-breaking vessels and two hovercraft. Canada's oldest and largest icebreaker, the CCGS Louis S. St-Laurent, was commissioned in 1969. It was to be replaced in 2017 by the CCGS John G. Diefenbaker. But from the initial estimate of $720 million, the Diefenbaker is now expected to cost over $1.4 billion, with delivery in 2022. To meet Ottawa's need for "interim icebreakers," Davie found four icebreakers built for oil and gas drilling off the coast of Alaska that were idled when oil prices fell, putting an end of Shell's Arctic venture. Prime Minister Justin Trudeau agreed to negotiations with Davie to acquire the three smaller ice-breaking vessels, leaving aside the larger Aiviq. With no other shipyard matching Davie's proposal, the conversion work will begin this summer.